Planning in settler-colonial countries is always taking place on the lands of Indigenous peoples. While Indigenous rights, identity and cultural values are increasingly being discussed within planning, its mainstream accounts virtually ignore the colonial roots and legacies of the discipline’s assumptions, techniques and methods. This ground-breaking book exposes the imperial origins of the planning canon, profession and practice in the settler-colonial country of Australia. 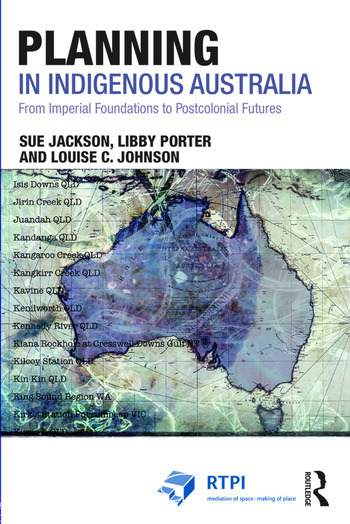 By documenting the role of planning in the history of Australia’s relations with Indigenous peoples, the book maps the enduring effects of colonisation. It provides a new historical account of colonial planning practices and rewrites the urban planning histories of major Australian cities. Contemporary land rights, native title and cultural heritage frameworks are analysed in light of their critical importance to planning practice today, with detailed case illustrations. In reframing Australian planning from a postcolonial perspective, the book shatters orthodox accounts, revising the story that planning has told itself for over 100 years. New ways to think and practise planning in Indigenous Australia are advanced. Planning in Indigenous Australia makes a major contribution towards the decolonisation of planning. It is essential reading for students and teachers in tertiary planning programmes, as well as those in geography, development studies, postcolonial studies, anthropology and environmental management. It is also vital reading for professional planners in the public, private and community sectors. Sue Jackson is Associate Professor and Principal Research Fellow at Griffith University, Brisbane, Australia. She is a cultural geographer with expertise in the social dimensions of natural resource management in Australia, particularly Indigenous community-based conservation initiatives, knowledge practices and institutions. In 2014 Sue was awarded an Australian Research Council Future Fellowship. Libby Porter is Associate Professor and Vice Chancellor’s Principal Research Fellow at RMIT University, Australia. Her work addresses the politics of dispossession and displacement in planning and urban theory. Libby is Assistant Editor of the journal Planning Theory and Practice and co-founder of Planners Network UK. Her major publications include Unlearning the Colonial Cultures of Planning (2010) and Planning for Coexistence? Recognizing Indigenous rights through land-use planning in Canada and Australia (2016, with Janice Barry). Louise C. Johnson is Professor of Australian Studies at Deakin University, Melbourne, Australia. A human geographer, she was awarded the Institute of Australian Geographers Australia International Medal in 2012 for her contributions to geography. Louise's major publications include Suburban Dreaming: An interdisciplinary approach to Australian cities (1994), Placebound: Australian feminist geographies (2000) and Cultural Capitals: Revaluing the arts and remaking urban spaces (2009).